Something of a footnote in musical history, Franz Ignaz Beck is finally emerging from the shadows cast by his more celebrated contemporaries. This is thanks to a couple of recent issues by Naxos. This CD is the second in a short series of orchestral music by Beck. His six Op. 1 symphonies are already available, played by the New Zealand Chamber Orchestra. This second volume from the Toronto Chamber Orchestra under Kevin Mallon tackles four works from his larger-scale Op. 3 set. A native of Mannheim, the young Beck was talent-spotted by the music-loving Elector Carl Theodor, who supervised his education until the restless lad moved to Italy and then to France. It was there, while leader of an orchestra in Marseilles, that he penned the Op. 3 symphonies. As one would expect from a nominal member of the ‘Mannheim school’, the symphonies have much in common with orchestral works by Stamitz, Richter and others. But they are also sufficiently different to represent a distinctive voice. For a start, they are cast in four movements – although the recurring third movement minuets are the simplest sections of all four symphonies and do little more than lengthen them. More interesting are the other movements, which are full of rhythmic and melodic contrasts, and explore a range of tonalities. Take the final Presto of the first symphony (track 4), for example. Its frequent rhythmic changes of gear and tonal shifts recall C.P.E. Bach and even ‘sturm und drang’ Haydn. The Largo in the second symphony (track 6) is also mildly unsettling, making it clear that this music was not just written for entertainment. Other highlights include the final Prestos in both the third and fourth symphonies (tracks 12 and 16). The former is remarkably complex, with a shifting web of melodic lines, while the latter is distinguished by contrasting horn-calls against the strings. 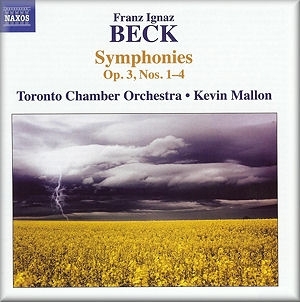 The Toronto Chamber Orchestra ably bring out the unusual aspects of Beck’s writing, although the tempi in the faster movements tend to be rather slow - there is, for example, little difference between their ‘presto’ and ‘prestissimo’ playing. But this is a minor quibble in an absorbing performance.